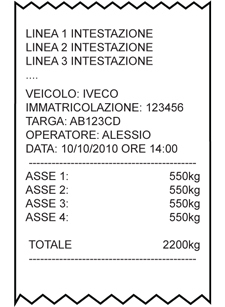 Input/output weighs' storage through ID CODE or VEHICLE PLATE (up to 999 suspended weighs). Database of 500 customers, each with three 25-character alphanumeric descriptions. Database of 500 articles, each with two 20-character alphanumeric descriptions. Database of 500 vehicles, each with a 10-character value of the plate, a 20-character alphanumeric description, and a linked tare. 6 levels of re-settable and independently printable totals: partial total, general total, grand total, customer total, article total and vehicle total. 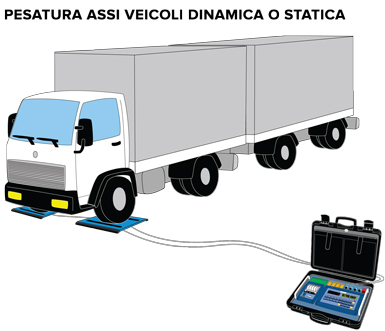 Fully programmable printout from the keypad or PC (using the free Dinitools software), with the weight of each axle as well as the total weight of the vehicle. 30 print formats can be combined with various functions (PRINT-key , totalisation, customer total, article total and vehicle total, Partial total, General total, Grand total ...); each print format may contain up to 2048 positions which may be ASCII codes or preconfigured print blocks (i.e. Company name, lot and weigh progressive numbers, gross weight, tare, net, etc.). The axle weighing systems are for internal use only.